Another week, another set of fun things that went on in this wonderful game called baseball. Lets get on with it! Los Angeles Dodgers lose another starter to injury: Well the Dodgers rotation just keeps taking hit after hit. This time in the form of “Tommy John” surgery for Chad Billingsley. Naturally, it ends his 2013 season immediately, and with Zack Greinke already on the disabled list, the rotation has gone from strength to question mark. Of course they still have Clayton Kershaw, but it is definitely time for Josh Beckett to pull an A.J. Burnett and start taking advantage of the National League switch. At 0-3, with an ERA of 4.68, really no place to go but up for him. Washington Nationals continue to struggle: Speaking of struggles, it isn’t often that you see a ball club handle expectations so poorly. But that is exactly what we are witnessing in Washington with the Nationals. Aside from Harper (7 HR, 15 RBI, .351/.429/.689) and Strasburg (1-4, 3.16 ERA and a hard-luck loser today) the rest of the team hasn’t quite got it going yet. Wilson Ramos has only played in six games and has been missed behind the plate production wise. The big issue is that Ryan Zimmerman, Jayson Werth, Ian Desmond, and Adam LaRoche have yet to put anything together at the plate. With the bullpen featuring just two members with an ERA under 4.00 it makes things more difficult. They’re currently on a four-game losing streak and are under .500 for the first time since 2011. The bigger red flag? So far in 2013 the Nationals are 1-8 against 2012 playoff teams (who are also 2013 contenders) including being swept by the Braves and Cardinals. Adam Wainwright is pitching like a man on a mission: If you haven’t tuned in to watch Adam Wainwright pitch this season (or any other for that matter) it’s time for you to start doing so. Wainwright (4-1, 1.93 ERA, 37 K’s, 1 walk) is putting together one heck of an April. He’s got an arsenal that includes a mid-90’s fastball and (no offense to Kershaw or Zito) still has the sickest fastball I’ve ever seen from a batter’s box (Wainwright is a Glynn Academy- Brunswick, GA- product and we were in the same Region in Georgia. It wasn’t fair, really). Good to play again in Boston, Props to the FCC: It was good to see the games resume in Boston this past week after the cowardly attack at the Boston Marathon. And I’d like to send props to FCC chairman Julius Genachowski for his tweet in regards to David Ortiz and his impassioned speech that contained a certain “NSFW” four-letter word in it. Julius tweeted shortly after that “David Ortiz spoke from the heart at today’s Red Sox game. 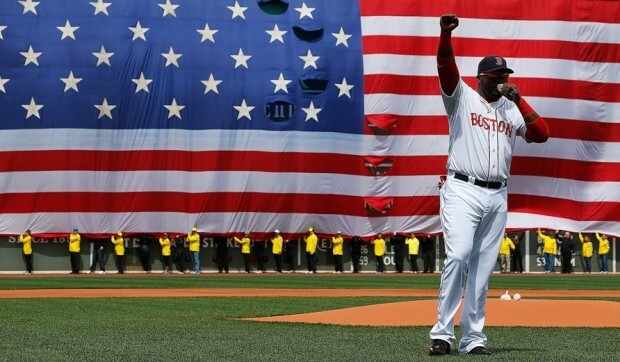 I stand with Big Papi and the people of Boston – Julius.” Cheers, Julius. Justin Upton continues to rake, setting records: Justin Upton continued his torrid April with two more home runs in a frigid day-night double-header against the Rockies. He tied and then broke the Braves franchise record for home runs in the month of April with his 11th home run (a back-to-back shot after his brother, B.J. went yard). The Braves struggled against the Pirates, losing 3-of-4 in Pittsburgh, but have since bounced back in Colorado to add to their league best record (15-5). I’m planning on writing a piece on him next week, but I think we can all agree that Matt Harvey is taking that next step in the league. Currently 4-0, with a .93 ERA, 32 K’s and just 9 walks, I knew how good he was, I just didn’t expect it this soon. For the record, I agree with Curt Schilling when he says he would take Harvey before Strasburg. Giancarlo Stanton remains without a home run in 2013. If the Marlins/Mets trade rumors has legs, it couldn’t come soon enough for Stanton. Speaking of the Marlins, they still rank last in team batting average, but you know the true mark of a team developing? 32 doubles, six home runs. Muscle up, boys!